NEW YORK TIMES BESTSELLER • This cookbook has 101 delicious recipes for home chefs of all abilities. 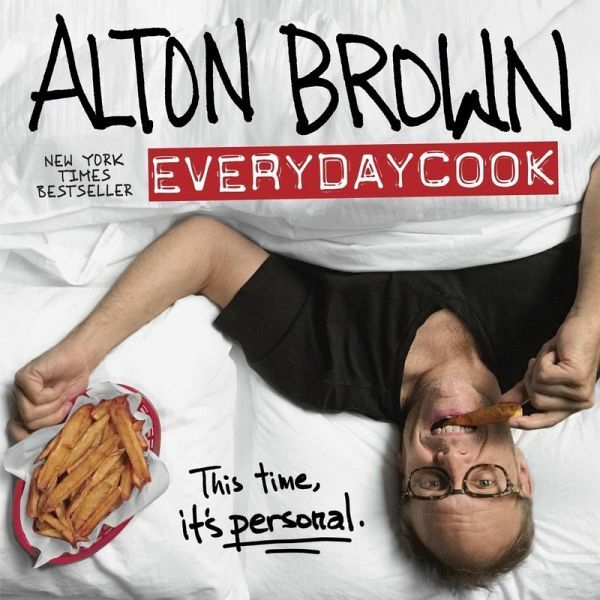 My name is Alton Brown, and I wrote this book. It's my first in a few years because I've been a little busy with TV stuff and interwebs stuff and live stage show stuff. Sure, I've been cooking, but it's been mostly to feed myself and people in my immediate vicinity-which is really what a cook is supposed to do, right? Well, one day I was sitting around trying to organize my recipes, and I realized that I should put them into a personal collection. One thing led to another, and here's EveryDayCook. There's still plenty of science and hopefully some humor in here (my agent says that's my "wheelhouse"), but unlike in my other books, a lot of attention went into the photos, which were all taken on my iPhone (take that, Instagram) and are suitable for framing. As for the recipes, which are arranged by time of day, they're pretty darned tasty. Highlights include: • Morning: Buttermilk Lassi, Overnight Coconut Oats, Nitrous Pancakes • Coffee Break: Cold Brew Coffee, Lacquered Bacon, Seedy Date Bars • Noon: Smoky the Meat Loaf, Grilled Cheese Grilled Sandwich, "EnchiLasagna" or "Lasagnalada" • Afternoon: Green Grape Cobbler, Crispy Chickpeas, Savory Greek Yogurt Dip • Evening: Bad Day Bitter Martini, Mussels-O-Miso, Garam Masalmon Steaks • Anytime: The General's Fried Chicken, Roasted Chile Salsa, Peach Punch Pops • Later: Cider House Fondue, Open Sesame Noodles, Chocapocalypse Cookie So let's review: 101 recipes with mouthwatering photos, a plethora of useful insights on methods, tools, and ingredients all written by an "award-winning and influential educator and tastemaker." That last part is from the PR office. Real people don't talk like that. Alton Brown used to direct TV commercials and cook on the side. Then he got the crazy idea to go to culinary school and reinvent the food show. The result: Good Eats, which kept Brown gainfully employed for fifteen years and earned him a Peabody Award. Along the way he also hosted Iron Chef America and Feasting on Asphalt and wrote seven books in his spare time. In 2013 he launched a live culinary variety show called The Edible Inevitable tour, which played to sold out theaters across the United States. In the spring of 2016, Brown's new live show, Eat Your Science, toured forty U.S. cities. Brown also hosts the insanely popular Cutthroat Kitchen on Food Network.